Our 2019 concert, "Music and Imagination," took place at the Good Samaritan Episcopal Church in La Jolla, marking our 30th anniversary. Guest musician: Lesi Mei (piano). Pictures by Alan Su Photography. 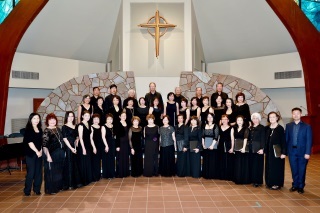 The Choral Consortium of San Diego hosted the third biennial San Diego Sings! Festival at Balboa Park. 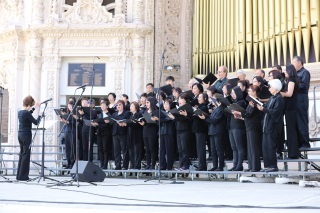 The San Diego Chinese Choral Society took the stage at the Spreckels Organ alongside 21 other local choirs, and joined together to perform "Homeland" and "America, the Beautiful," conducted by Dr. Arlie Langager. Pictures courtesy of Ms. Qian Nancy Fan, Ms. Hua Mao, Mr. Hugh Wang, Ms. Wendy Meng and others.